This is where Aleister Crowley dictated his masterpiece. Description: This is where Magickal author Aleister Crowley, at the age of 46, dictated his masterpiece, The Diary of a Drug Fiend, to Leah Hirsig, his Scarlet Woman. They were both staying here, and it reportedly took twenty-seven days, twelve and a half hours to complete it. 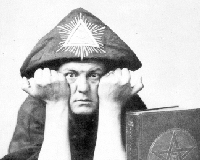 It's Crowley's definitive document on the theory behind the Magickal Record. As the title implies, the diary is central to the cure of two drug addicts.